Harrisburg, PA – Today, Governor Wolf announced the approval of new funding to Workforce Solutions of North Central Pennsylvania to provide trainees with electronics and machinery training at no cost to help them get jobs with local manufacturers. The grant will provide $150,000 to Workforce Solutions of North Central Pennsylvania to offer new programs that will provide training in electronics and instrumentation as well as CNC lathe programming and operation. The programs will enable 40 trainees to gain industry-recognized credentials free of charge to the trainee. Curricula for the programs will be based on input from local manufacturers to best meet the specific needs of the region’s manufacturing employers. The Pennsylvania Manufacturing Training-to-Career grant is designed to provide funding for training programs to help unemployed and underemployed individuals, as well as those with barriers, to gain the skills they need to gain employment in the manufacturing sector. Eligible applicants include technical and trade schools, universities, and nonprofit organizations that develop new and innovative training programs and partner with two or more manufacturers. 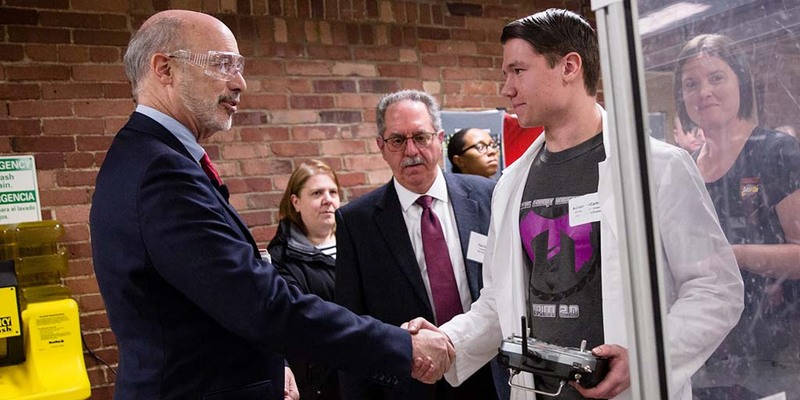 Governor Wolf recently announced other Training-to-Career grants to Precision Manufacturing Institute, the Manufacturers Research Center, the Greater Johnstown Career & Technical Center and Robert Morris University.